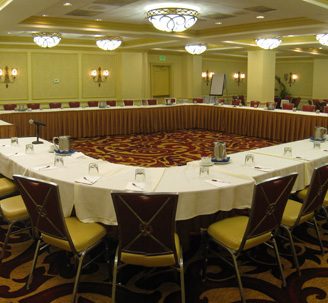 At the Hamilton Crowne Plaza in Washington DC, we know you are busy with your day-to-day work activities and sometimes planning your company’s meetings and events can add unnecessary stress to your day. This is why we have an entire team dedicated to planning the specifics of your meeting, so you don’t have to. With a dedicated Crowne Meetings Director, an award winning Meetings and Events Staff, the latest in conference technology, and a perfect location in the heart of Washington DC, your next meeting is sure to be a great success. Our team has put together the Perfect Meeting Solution Package to provide the value and quality you need for a successful event. – both for your attendees and your budget. This special package includes the Presidential Break Package offering early morning continental, a mid-morning refresh break, and an afternoon break; our standard audio/visual package including 1 screen, LCD projector and cart, 1 flipchart with markers, pens and notepads; and ice water and candy. The package also includes complimentary wireless internet and room rental for one meeting room. In addition, we are providing a pick-your-perk incentive that allows you to select which extra benefit will add the most value to your meeting. You can choose between complimentary meeting room internet, 50% off room rental, or a complimentary early morning break. As an added bonus, we are offering 500 Priority Club Meeting Rewards Points for every $1,000 of food and beverage spending during your event. To reserve your dates and start planning your next event simply call us directly at 202-218-7515 or send your RFP to sales@hamiltonhoteldc.com.